An interesting and powerful new app, with a whole new way to support a child with little/no/developing speech. It moves away from the traditional grid formatted AAC system and gives us “word trees” – beautiful circles of words and stems, that all interconnect as sentences are constructed! It reminds me of all those mind maps/word webs we used to draw when were planning our writing at school! The powerful word prediction system built within aacorn, is such a great way to help children learn to put sentences together to communicate faster and more effectively. This word prediction is used to help guess what word the child wants to say next. Logical options are presented to help complete the sentence. It is also super easy to add words to sentences when nothing has been predicted. acorn then remembers these words that have been added to a sentence, so that they are presented automatically next time. Only presents 5 main choices off each category at a time, keeping it simple and distraction free. By simply pushing the category button, it takes you through other word choices in that category. aacorn uses real recorded voices, not a text-to-speech voice. You can choose between boy and girl US, UK, and Australian voices. Whilst this means that the voices are very natural sounding, it does mean that you need to record your own voice when you add new vocabulary items. Highly customisable, with the ability to add, edit and change words easily. Here’s a quick video demonstration of aacorn. 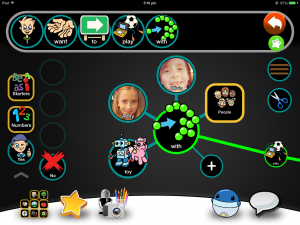 This innovative app could really change the way we introduce, teach and model AAC systems to early communicators. If you have tried aacorn, we would love to hear from you! Leave us a comment! Tell us what you think! This entry was posted in New Technologies Opinion. Hello, I work in the speech department in a WA state school district, and have been in contact with Wayne at aacorn. I am also our iPad coordinator in district and am excited about this app for many of our students. Great job and thank you! Thanks for cool demo, looks like a useful , innovative app.Just a question. For those students not yet up to “correct” sentence structure (and miss out little words like “is, the etc) and may communicate “I hungry” is there an edit mode for this? (e.g. would you “prune” ? , or rely on the word prediction from a previous example)? I also realiase this may also just be the issue of, not suitable for this particular student. What are your thoughts? ‘Pruning’ is just a quick edit feature to hide an unwanted word where you’re trying to encourage a particular behavior or if say for example a child likes to obsess on a word a bit too much. This may sound more complicated than it is, and of course how/when you use and the involvement of a speech and language professional is the key to success, but the beauty of the word tree and aacorn’s open ended approach is by making it much faster and easier to find words and build sentences it provides a framework to develop grammatical or more complex language, rather than time spent searching for individual words. Grids and folders are fine provided you know which word you want and where to look for all of them – but for far too many children (and many of us adults that is a very big ask. Thanks for the article. This new app seems like a great addition to the AAC arsenal. Just wondering if you had any comparisons with proloquo2go? Is one ‘easier’ or more suitable for children? Particularly those who have no literacy skills yet? As Amanda is on the road doing training workshops I am answering on her behalf. I would say that they are both apps that could be used with children with no literacy skills. Proloquo2Go comes with a Basic vocabulary useful for children learning early word combinations and then you can switch to a Core Word vocabulary which allows for greater word combinations. Proloquo2Go has more features for customising (particularly for alternative access, pronunciations, expressions, grid size) and can certainly grow with the child with options for synthesised voices and text to speech down the track. However, some people prefer Aacorn for it’s simple interface. The biggest difference with Aacorn is the word tree for building sentences – and it learns what you say and predicts the words based on this. Both could be used well with young children. The power in any AAC app will come with modelling and learning language in fun, motivating and functional contexts. It is hard to trial these apps without purchase but you can view videos of them on the Assistiveware website and Aacorn website. Thanks so much for your reply Charlene. Very helpful. Are there any plans to make a lite version of this App available ? The free version is currently waiting apple approval. You can certainly contact the developer devteam@aacorn.co if you have further questions about when this might be available. It is always exciting to see a new AAC tool. The AACORN website page states that the app is good for all children and abilities and lists cerebral palsy as one of the diagnoses as a target audience. I don’t see whether it is switch accessible or if it would work well with a switch. I’ve looked at both the website and the Facebook page. I understand that the app is just getting started, but wanted to check as we are in the market for a new device. Thanks. This app is not switch accessible but you could contact the developer to see if there are any plans to include this in an update.